Shares soar 40% as struggling stores chain continues talks with creditors over long term survival. On average, 4,500 complaints were made to local authorities in the UK every day last year. PROFILE: The Daily Mirror is a British tabloid "red top" newspaper founded in 1903. 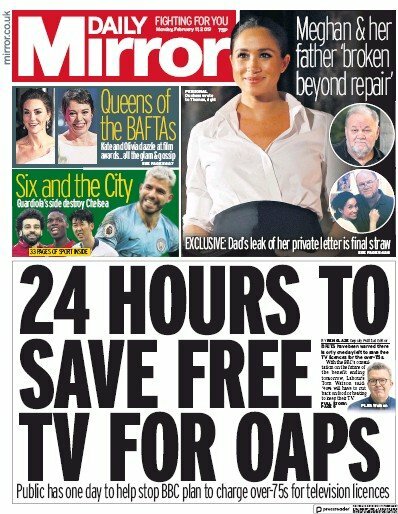 Currently owned by the Trinity Mirror Group, twice in its history, from 1985 to 1987, and from 1997 to 2002, the title on its masthead was changed to read simply The Mirror, which is still how the paper is often referred to. The newspaper has a decidedly left-wing slant, and has consistently endorsed the Labour Party over the years. On 4 May 2010, the newspaper printed a picture of Conservative Leader David Cameron with a giant red cross through his face. The headline read "How to stop him" in reference to the general election two days later, thus confirming the Daily Mirror's Labour allegiance. Profile extracted from Wikipedia and used under the Creative Commons Attribution-ShareAlike License. Circulation: 1,172,785 (April 2011) Political Outlook: Left-Wing, Pro-Labour See our UK Newspaper Guide. Daily Mirror newspaper from UK is available through PressDisplay.com where you can browse and read hundreds of full content premium newspapers and magazines from around the globe. With a subscription to PressDisplay.com, users gain access to full print versions of newspapers on the day they are published.